More and more countries have been adopting population policies to increase birth rates, in order to deal with the growing challenges of aging (United Nations 2013). Following the recent trend, China, the most populous country in the world, ended its 35-year-long one-child policy and started to allow two children for each married couple from January 1, 2016. It is still too early to evaluate the new two-child policy directly. However, something may be learnt from what has happened in Yicheng in the past 30 years. 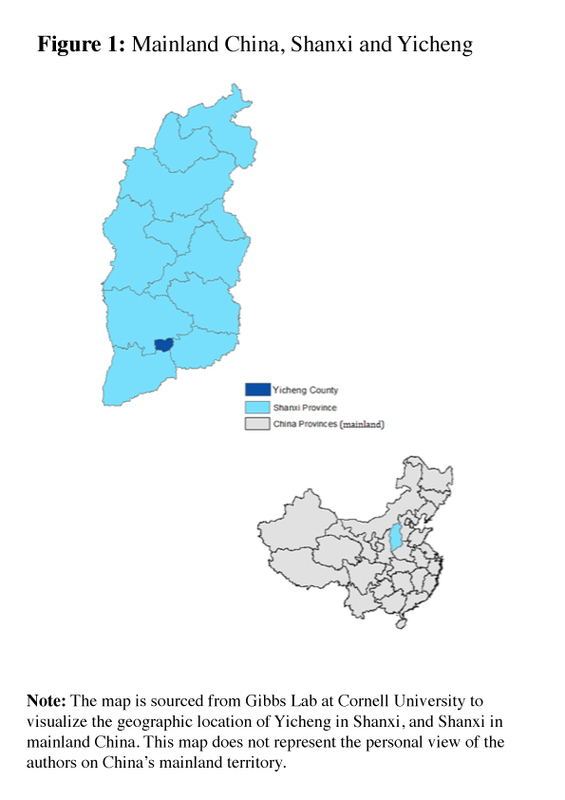 Yicheng is a typical agricultural county in Shanxi province with a population that is over 80% rural (Figure 1). It first adopted the two-child policy in 1985, aiming to observe how fast birth rates would increase if fertility restrictions were relaxed. The Yicheng policy allowed each rural couple to have two children if two conditions could be met: late marriage and an interval between the first and second birth of six years (later reduced to four). To be sure, neither of these requirements is mentioned in the 2016 national policy, but the demographic reality has evolved in such a way as to make the two situations comparable. Yicheng was not the only jurisdiction in China to be exempted from the one child policy. However, it is the only place where the two-child policy was applied to a large population, for 30 years and without interruption. Elsewhere, this exemption was granted to minorities, such as mountain populations or ethnic minorities, or repealed after some time. In short, Yicheng is probably the most appropriate location to study the effects of the two-child policy (Liang, 2014). In a recent paper (Qin and Wang, 2017), we presented a counterfactual analysis of the potential impact of relaxing the one-child policy on birth rates by observing what happened in Yicheng. We compared two birth rates:¹ that of Yicheng and that of an artificial, but similar, control group (synthetic Yicheng), and estimated both the short-term and long-term effect of the two-child policy. The synthetic Yicheng was constructed by grouping all the counties of Shanxi province except Yicheng. The result is shown in Figure 2, which presents both crude birth rates (CBR). 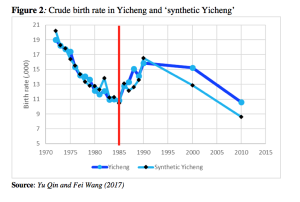 In general, the synthetic control group closely followed the trend of birth rates in Yicheng prior to implementation of the two-child policy in 1985. Both birth rate series showed a downward trend before 1985, which reflected the effects of both family planning policies and socioeconomic development. In 1985 the “experiment” started, and until 1990 the birth rate increased, as one would expect. However, it increased both in Yicheng (where the two-child policy was implemented) and in the synthetic Yicheng, with no such policy. Later, in both 2000 and 2010, fertility declined again, although more in the synthetic control group than in Yicheng. To summarize: the short-run effect of the two-child policy in Yicheng was barely visible and its long-run effect limited (about 2 births per 1,000 people). Could these results be biased? Let us examine a few possible confounders. The first is migration, which was possible between counties. However, it was very limited: according to the 1990 census sample, the fraction of migrants in Yicheng did not increase between 1985 and 1990, the first five years of the two-child policy, and it remained below 2% subsequently. Besides, if anything, the bias operates in the opposite direction, because the migrants attracted by the new policy were more likely to be selected: they probably wanted to have two children instead of just one, and in Yicheng were able to do so. Another of the possible reasons why the two-child policy did not produce any major effect is that its enforcement was weak before 1990. In the first decade, more than half of the second children in Yicheng were born without a permit because their parents violated relative requirements (Wu 2014). The ratio of unpermitted second children significantly dropped after 1995, and became negligible in 2010 (Wu 2014). This, in turn, is probably due to the fact that, by the mid-1980s, the Chinese central government had relaxed the one-child policy to the “one-and-half-child” policy whereby a rural couple could have a second child if their first was a female. However, these requirements were not clearly understood at first, and a number of local authorities and residents believed that two children were generally allowed (Yang 2004). This probably explains the rise in birth rates in both Yicheng and synthetic Yicheng shown in Figure 2. Our research is likely to have slightly overestimated the impact of the two-child policy on the birth rate. 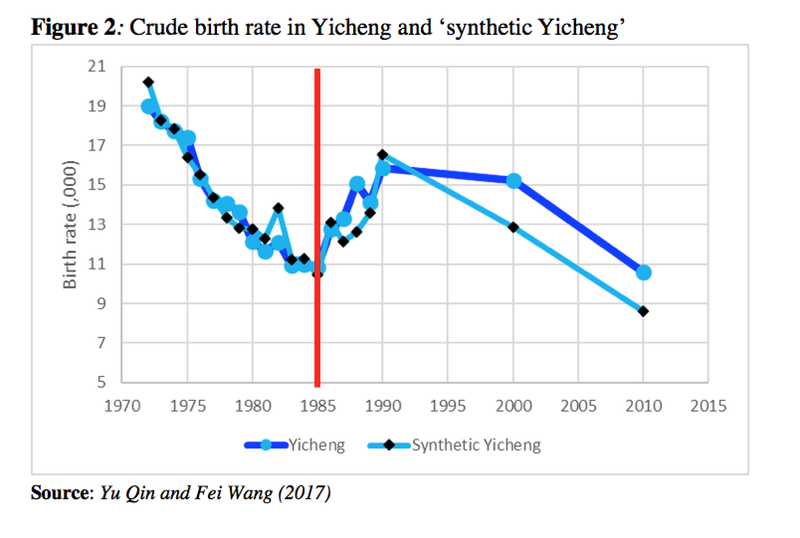 Our synthetic Yicheng is slightly more urbanized and healthier than Yicheng itself, and thus likely to have a lower birth rate, independently of the demographic policy in force. The method itself may be criticized, but we tried alternative estimates of the upper bound of fertility variations attributable to the law, and still got very limited effects. Finally, it is true that birth rates in China’s datasets tend to be underreported (e.g., Zhang and Zhao 2006), but as this applies to both Yicheng and the synthetic Yicheng, it should not affect our conclusions. 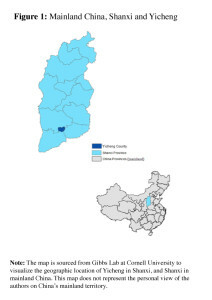 In short, our conclusions are that replacing the one- (or one-and-a-half) child policy with the two-child policy, as China did in early 2016, will likely have a very limited impact on fertility in the short term, and possibly none at all in rural areas such as Yicheng. It may be too late to alter the aging trend by simply relaxing the maximum accepted number of children. More active policies are probably needed if fertility is to be revived. Liang, Z. (2014). China population problem. Beijing: China Development Press. Qin, Y. and Wang, F. (2017). Too early or too late: What have we learned from the 30-year two-child policy experiment in Yicheng, China? Demography Research 37: 929-956. United Nations (2013). World Population Policies 2013. New York: United Nations Publication. ¹ Unfortunately, it is impossible to use the TFR (or total fertility rate) to measure fertility, as this is available only in the years of China’s national population censuses. However, we made sure that the synthetic Yicheng was comparable to Yicheng not only in terms of birth rates before 1985, but also with respect to the gender and age structure.